The cottage is a very spacious studio, perfect for one to two people. Most folks say it is actually much roomer than it looks online!! It was designed with the aesthetic at heart and an attention to detail. It is fully and comfortably furnished with beautiful teak furniture, a leather couch, and a comfortable king size bed. It has high ceilings, charming warm colors, wood floors, a complete kitchen, and a full bath. 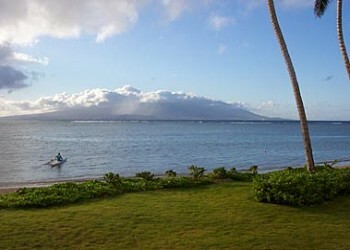 It also has a large, covered lanai with, of course, a beautiful ocean view. The deck has a teak table and chairs set, plus two comfy, cushioned patio chairs. The cottage is situated on the property in such a way which maximizes privacy from our main house while offering an unobstructed ocean view.